The collimator in single photon emission computed tomography (SPECT), is an important part of the imaging chain. One of the most important collimators that used in research, preclinical study, small animal, and organ imaging is the pinhole collimator. Pinhole collimator can improve the tradeoff between sensitivity and resolution in comparison with conventional parallel-hole collimator and facilities diagnosis. However, a major problem with pinhole collimator is a small field of view (FOV). Multi-pinhole collimator has been investigated in order to increase the sensitivity and FOV with a preserved spatial resolution. The geometry of pinhole and multi-pinhole collimators is a critical factor in the image quality and plays a key role in SPECT imaging. The issue of the material and geometry for pinhole and multi-pinhole collimators have been a controversial and much disputed subject within the field of SPECT imaging. On the other hand, recent developments in collimator optimization have heightened the need for appropriate reconstruction algorithms for pinhole SPECT imaging. Therefore, iterative reconstruction algorithms were introduced to minimize the undesirable effect on image quality. Current researches have focused on geometry and configuration of pinhole and multi-pinhole collimation rather than reconstruction algorithm. The lofthole and multi-lofthole collimator are samples of novel designs. The purpose of this paper is to provide a review on recent researches in the pinhole and multi-pinhole collimators for SPECT imaging. Radiosynovectomy is a well-established therapy in arthritis and involves an intra-articular injection of small radioactive particles to treat a synovitis. In Europe, frequent indications are rheumatoid and poly-arthritis. Especially in Germany radiosynovectomy is the second common therapy in Nuclear Medicine with about 40,000-60,000 treated joints per year. In Spain, USA, Turkey, Argentines and Philippines the therapy is more use in hemophilic arthritis with excellent results. Especially in developing countries with low availability of clotting factors, the radiosynovectomy represent a cost effective therapeutic option for repeated bleedings in hemophilic arthropathy. The special focus in these countries is maintaining of mobility and work ability. Often only the knee and medium joints (ankle, elbow and shoulder) are treated using yttrium-90, rhenium-186 or phosphorus-32. However, in rheumatoid arthritis most common affected joints are the fingers. For the treatment in these small joints, erbium-169 is necessary. Unfortunately, erbium-169 is only available in Europe. Further indications for radiosynovectomy are osteoarthritis and the articular effusion after joint replacement. The reported response rates in rheumatoid and poly-arthritis range from 60% to 80% depends from the stage of previous arthrosis. The best effectiveness of therapy was observed in hemophilic arthritis with response rate of 90% and significant reducing of bleeding frequency. The therapy is well-tolerated with low rate of side effects. In respect of the specific uptake of particles in the synovia and short range of beta radiation, the radiation exposure outside the joint is very low. The radiosynovectomy has efforts in comparison to surgical synovectomy: it's a minor intervention with low costs; and simultaneous treatments of multiple joints or treatment in short intervals are possible. The presented paper summarized the published papers and reports our own experiences in >15,000 treated joints. Radioactive iodine treatment is a type of internal radiotherapy that has been used effectively for the treatment of differentiated thyroid cancer after thyroidectomy. The limit of this method is its affects on critical organs, and hence dosimetry is necessary to consider the risk of this treatment. Scope of this work is the measurement of absorbed doses of critical organs by Monte Carlo simulation and comparing the results with other methods of dosimetry such as direct dosimetry and Medical Internal Radiation Dose (MIRD) method. To calculate absorbed doses of vital organs (thyroid, sternum and cervical vertebrae) via Monte Carlo, a mathematical phantom was used. Since iodine 131 ( 131 I) emmits photon and beta particle, *F8 tallies, which give results in MeV were applied and the results were later converted to cGy by dividing by the mass within the cell and multiplying by 1.6E-8. The absorbed dose obtained by Monte Carlo simulations for 100, 150 and 175 mCi administered 131 I was found to be 388.0, 427.9 and 444.8 cGy for thyroid, 208.7, 230.1 and 239.3 cGy for sternum and 272.1, 299.9 and 312.1 cGy for cervical vertebrae. The results of Monte Carlo simulation method had no significant difference with the results obtained via direct dosimetry using thermoluminescent dosimeter-100 and MIRD method. Hence, Monte Carlo is a suitable method for dosimetry in radioiodine therapy. The efficacy of the whole body (WB) 18 F-fluorodeoxyglucose ( 18 F-FDG) positron emission tomography-computed tomography (PET-CT) as a part of conventional initial staging in all cases of head and neck squamous cell carcinoma (HNSCC) is still controversial with various studies in literature giving contradictory reports. We conducted this study at a government tertiary care oncology center in India to identify the impact of WB 18 F-FDG PET-CT scan on HNSCC staging and treatment. A prospective clinical study of patients of HNSCC who were evaluated and treated at our center was performed. The patients included in the study were HNSCC of the oral cavity, oropharynx, hypopharynx, larynx, nasopharynx, and carcinoma of unknown primary site (CUPS) with cervical metastasis. The study design was to evaluate the cases of HNSCC initially by staging with conventional investigations followed by staging with the information derived from WB 18 F-FDG PET-CT scan. At the end of the conventional investigations, a tumor, node, metastasis (TNM) staging as per AJCC 7 th edition, and a detailed treatment plan as per NCCN 2012 guidelines was decided in consultation with the multidisciplinary oncology team of the hospital. 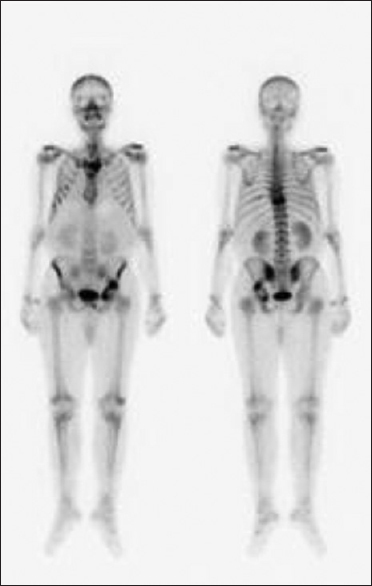 WB 18 F-FDG PET-CT scan was carried out in all these patients. 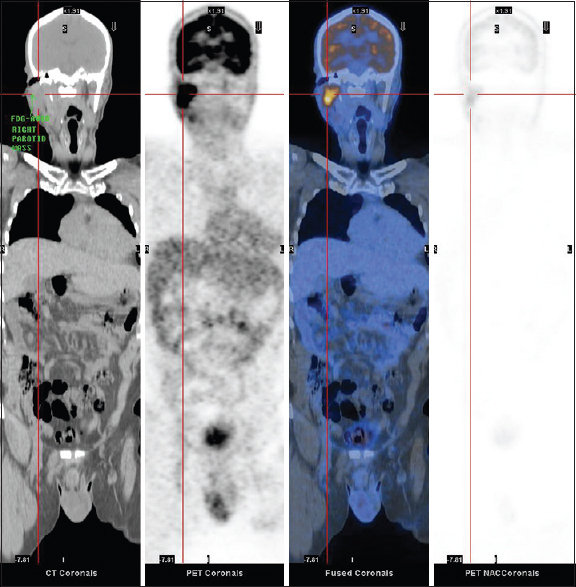 The findings of WB 18 F-FDG PET-CT were then interpreted with the staging with conventional investigations to identify the cases with change in staging and also those in whom the treatment protocol would be affected. Descriptive analysis of demographic data and analytical analysis of the sensitivity and specificity of WB 18 F-FDG PET-CT scan and also the change in staging and treatment plan after WB 18 F-FDG PET-CT scan was analyzed using SPSS version 18. A total of 131 patients met the inclusion criteria, which included 123 males and 8 females. The various sites involved among the study group are oral cavity 11 (8.3%), oropharyn × 39 (29.7%), hypopharyn × 31 (23.6%), laryn × 34 (25.9%), nasopharyn × 4 (3%), and CUPS 12 (9.1%). The majority of cases studied were of T2 and T3 stage, and changes in T staging after WB 18 F-FDG PET-CT scan were minimal and not statistically significant (P > 0.5). In the nodal staging after WB 18 F-FDG PET-CT scan, there was a statistically significant change in identification of nodal metastasis in N0 group and also identification of additional multiple/bilateral nodes (N2b and N2c). 3 (2.2%) patients had a change in M status with identification of distant metastasis in lungs (2 patients) and in the liver and lung (1 patient). Of the 131 patients, 75 (57.25%) underwent surgical management with or without adjuvant treatment (Group I) and 56 (42.74%) patients underwent nonsurgical management (Group II). There was no significant statistical difference in sensitivity and specificity of 18 F-FDG PET-CT scan in detecting cancer among the two groups. Considering all the patients in this study, WB 18 F-FDG PET-CT scan showed an overall sensitivity of 95.2% and specificity of 80%. In this study, change in TNM staging after WB 18 F-FDG PET-CT was seen in 22 (16.8%) patients and an alteration in the treatment in 21 (16.1%) patients, which were both found to be statistically significant (P < 0.5). In our study, WB 18 F-FDG PET-CT scan has shown to have an impact on initial staging of disease affecting the change in treatment protocol in a significant number of patients. The effect of this change in staging and treatment on the eventual morbidity and mortality rates is not known. In practice, the use of 18 F-FDG PET-CT scan is limited, owing to the high cost and low availability. A realistic evaluation of cost versus benefit needs to be undertaken to identify the impact of using 18 F-FDG PET-CT scan as a mode for initial evaluation of HNSCC. 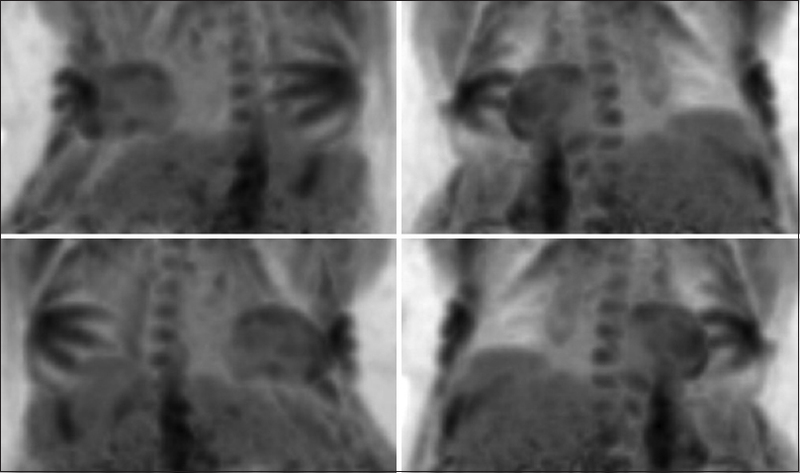 Focal 18 F-fluorodeoxyglucose (FDG) colonic activity can be incidentally seen in positron emission tomography/computed tomography (PET/CT) scans. Its clinical significance is still unclear. The purpose of this study was to assess the significance of focal FDG activity in PET/CT scans by correlating the imaging findings to colonoscopy results, and come up with some guidelines for recommendation of follow-up colonoscopy. A total of 133 patients who underwent both 18 F-FDG PET/CT for different oncological indications and colonoscopy within 3 months were retrospectively studied. Imaging, colonoscopy and pathology results were analyzed. Of the 133 FDG-PET/CT scans, 109/133 (82%) did not show focal colonic FDG activity, and 24/133 (18%) did. Of the 109/133 PET/CTs without focal colonic FDG activity, 109/109 (100%) did not have evidence of colon cancer after colonoscopy and histology. Of the 24/133 PET/CTs with focal colonic FDG activity, 10/24 (42%) had pathologic confirmation of colon cancer and 14/24 (58%) did not have evidence of colon cancer after colonoscopy and histological analysis. Sensitivity was 10/10 (100%), specificity 109/123 (89%), positive predictive value (PPV) 10/24 (42%) and negative predictive value (NPV) 109/109 (100%). Incidental focal 18 FDG activity in PET/CT imaging shows a high sensitivity, specificity and NPV for malignancy, with a not so high PPV of 42%. Although some people would argue that a 42% chance of malignancy justifies colonoscopy, this maybe is not possible in all cases. However, the high sensitivity of the test does not allow these studies to be overlooked. We provide our recommendations as per when to send patients with focal FDG colonic activity to have further characterization with colonoscopy. Fertility after orchidopexied undescended testes (UDT) is impaired. Although fertility parameters are known to be more favorable in unilateral cases than in bilateral cases, the exact contribution of the unilateral orchidopexied UDT to fertility is unknown. We used testicular 18 F-fluoro-2-deoxyglucose ( 18 F-FDG)-uptake assessed by positron emission tomography/computed tomography (PET/CT) to investigate the function of the orchidopexied unilateral congenital UDT, compared to its normally descended counterpart. We hypothesize that the contribution of the orchidopexied unilateral congenital UDT to fertility in adulthood is low. Eleven men who underwent orchidopexy for congenital UDT at the age of 1.9 ± 1.4 (range, 4.5 months -4.0) years were seen in follow-up at the age of 24.1 ± 2.3 (20.6-28.0) years. All underwent physical examination, testicular ultrasonography and PET/CT. Testicular 18 F-FDG-uptake was expressed as the peak Standardized Uptake Value (SUV peak ). The mean SUV peak of the orchidopexied UDT was 2.74 ± 0.48 (2.13-3.47), which was significantly lower than its counterpart (P = 0.021). Besides, there was no correlation between the testicular volume and the SUV peak . The orchidopexied congenital UDT has been shown to be less metabolically active than its contralateral counterpart. Nevertheless, we suggest that the operated testes function to some degree. 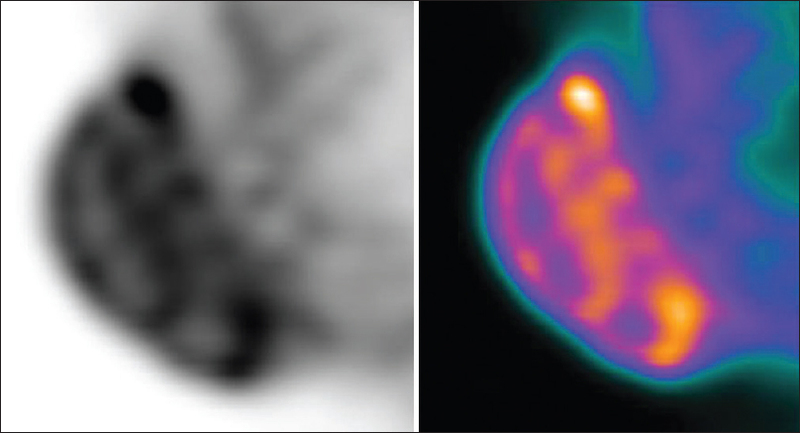 Positron emission tomography (PET) is currently the most advanced technique of metabolic imaging available for tumor diagnosis and follow-up. 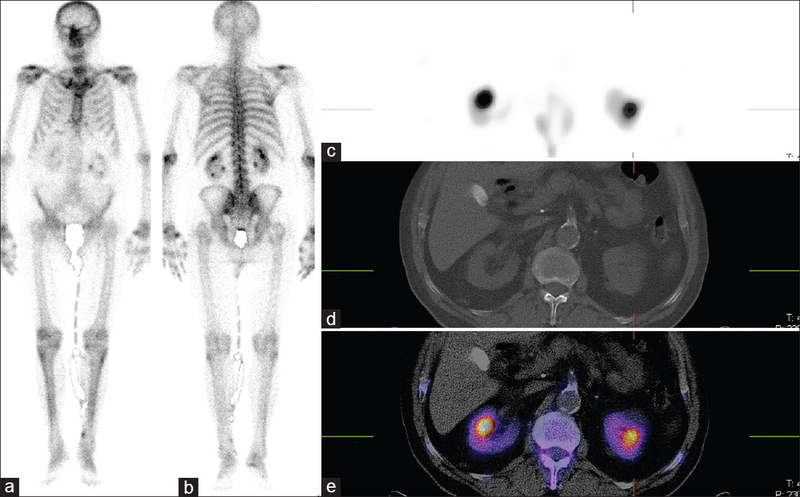 The aim of this study was to examine the versatility and accuracy of fluorodeoxyglucose (FDG) PET/computed tomography (CT) in the metastasis detection of renal cell carcinoma (RCC). We also compared our findings to other similar studies from the literature. This is the biggest study so far to examine the sensitivity and specificity of FDG PET/CT in the management of RCC. A retrospective review was carried out on all the FDG PET/CT studies done from January 1999 to January 2014 at our institution. Biopsy results were considered the gold standard. For our patients (n = 315) with biopsy results, FDG PET/CT studies exhibited 100% sensitivity, 100% specificity. Our results were better than results achieved by other studies. The use of FDG PET/CT in restaging and metastasis detection of RCC has many advantages, in addition to high accuracy. This imaging technique has great potential in influencing treatment decisions. We recommend the incorporation of FDG PET/CT in routine standard protocols for RCC. Single-photon emission computed tomography-computed tomography (SPECT-CT) allows for physiological and anatomical co-registration in sentinel lymph node (SLN) mapping and offers additional benefits over conventional planar imaging. However, the clinical relevance when considering added costs and radiation burden of these reported benefits remains somewhat uncertain. This study aimed to evaluate the possible added value of SPECT-CT and intra-operative gamma-probe use over planar imaging alone in the South African setting. 80 patients with breast cancer or malignant melanoma underwent both planar and SPECT-CT imaging for SLN mapping. We assessed and compared the number of nodes detected on each study, false positive and negative findings, changes in surgical approach and or patient management. 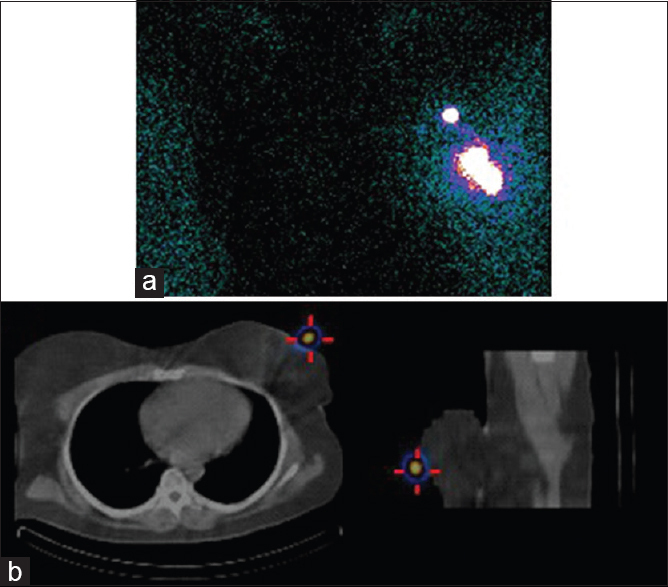 In all cases where a sentinel node was identified, SPECT-CT was more accurate anatomically. There was a significant change in surgical approach in 30 cases - breast cancer (n = 13; P 0.001) and malignant melanoma (n = 17; P 0.0002). In 4 cases a node not identified on planar imaging was seen on SPECT-CT. In 16 cases additional echelon nodes were identified. False positives were excluded by SPECT-CT in 12 cases. The addition of SPECT-CT and use of intra-operative gamma-probe to planar imaging offers important benefits in patients who present with breast cancer and melanoma. These benefits include increased nodal detection, elimination of false positives and negatives and improved anatomical localization that ultimately aids and expedites surgical management. This has been demonstrated in the context of industrialized country previously and has now also been confirmed in the setting of a emerging-market nation. On planar bone scintigrams, activity enhancement foci in projection to kidney and lower ribs can arise from the kidney, or from bone lesions. A differentiation based only on the exact location and shape of the hot spot can sometimes be misleading, resulting in a false qualification of a rib metastatic lesion as urine collection in the kidney or opposite. The authors illustrate the problem with three cases: In two patients, such a hot spot appeared to be the solitary metastatic focus; in one, highly suggestive for solitary metastatic focus, it was proven to be a urine collection. Palliation of bone metastases in hepatocellular carcinoma (HCC) is sometimes difficult. Systemic pharmaceuticals have been successfully used for the palliation of bone metastasis for many years. Safety of these agents in HCC is not known completely. We presented a male patient with decompensated liver cirrhosis with HCC. Multifocal bone metastases developed in this patient and he had refractory bone pain. We treated this patient with Sm-153 (samarium) after obtaining patient's consent. Two days after treatment, he experienced dyspnea and we detected a massive hemorrhagic pericardial effusion. He died due to this unexpected bleeding. We should use this radiopharmaceutical treatment cautiously in these cytopenic cirrhotic patients. 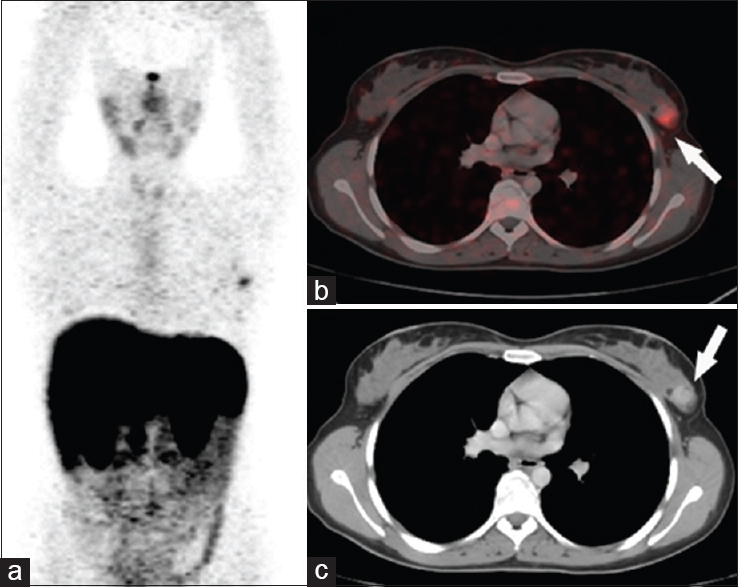 This case report explores the potential role of FDG PET/CT in HIV -associated systemic non-Hodgkin's lymphoma (HIV-NHLs). In our locality, there are a cumulative total of 5523 reported HIV infections cases since 1984. We reported a case of HIV-related Burkitt's lymphoma (BL) and a case of diffuse large B-cell lymphoma (DLBCL) that underwent PET/CT examination in our PET centre. In HIV-NHLs patients, we must be reminded that not all hypermetabolic foci represent lymphomatous lesions. There is a close correlation between the pattern of lymphoid tissue activation in FDG PET/CT and HIV progression in patients without HIV-related malignancy. The unique patterns of lymphoid tissue activation observed in HIV-infected patients have great clinical implications. Secondly, HIV-infected patients are prone to suffer from opportunistic infections due to immunosuppression, particularly in those with high levels of HIV viral loads. FDG PET/CT cannot reliably differentiate metabolic active lymphoma from other benign diseases such as inflammation in the context of low CD4 count and high viral loads. In those cases, benign markedly hypermetabolic foci can be erroneously interpreted as lymphoma, particularly in those normal-sized lymph nodes. Furthermore, FDG PET/CT may be useful for assessing the efficacy of HAART in suppressing HIV replication and detecting its complication such as lipodystrophy. FDG PET/CT may play a potential useful role in staging and management of HIV -associated systemic non-Hodgkin's lymphoma. Plasma variables such as viral loads and CD4 count must be taken into account during image interpretation. FDG PET/CT as a potential useful tool for diagnosis, treatment response assessment and disease relapse detection in HIV -associated systemic non-Hodgkin's lymphoma worth to be further explored. 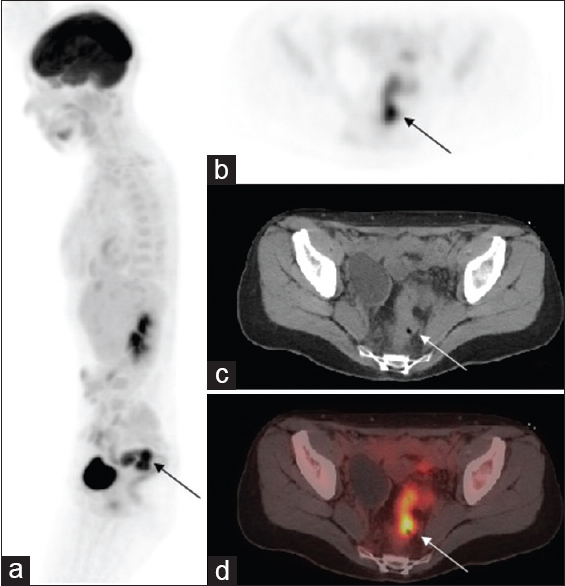 A positron emission tomography/computed tomography (PET/CT) study using 18 F-fluorodeoxyglucose ( 18 F-FDG) was performed in a 54-year-old female with polycystic kidney disease, fever, and abdominal discomfort. 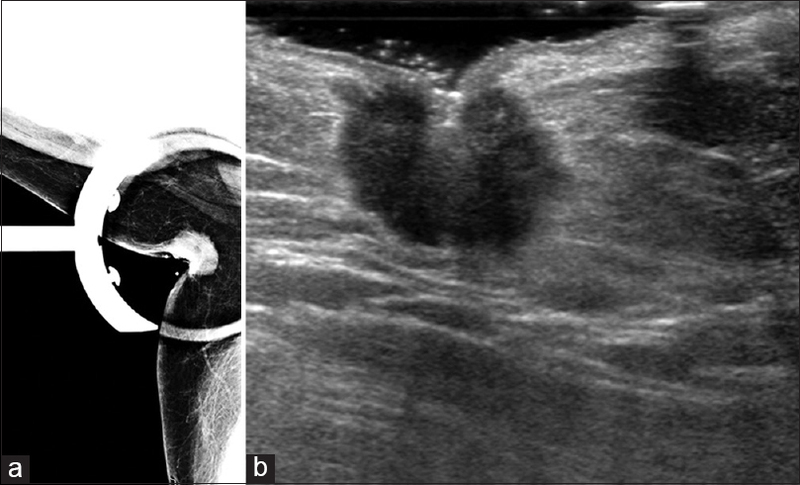 Cyst's infection was suspected, but CT and U/S findings were not specific to accurately depict pyocysts and guide surgical treatment. In PET/CT, both kidneys are enlarged with multiple cysts and little remaining parenchyma. There is intense focal or ring-shaped FDG uptake in cysts in the upper and lower poles of the left kidney indicative of active infection. There is also increased FDG uptake in para-aortic lymph nodes bilaterally. Hepatic and right renal cysts do not present increased FDG uptake. 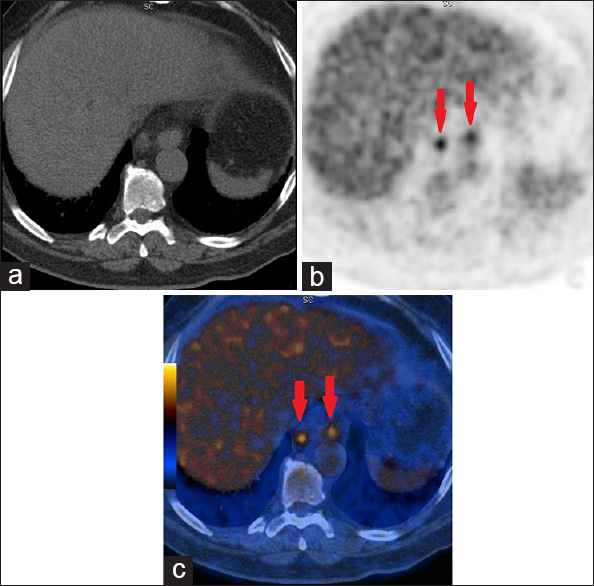 As this case illustrates, FDG PET/CT can be helpful for the precise localization of cyst infections in patients with polycystic kidney disease considered for surgical treatment. Biliptysis is an important clinical feature to recognize as it is associated with bronchobiliary fistula, a rare entity. Bronchobiliary fistulas have been diagnosed with planar cholescintigraphy. However, cholescintigraphy with single-photon emission computed tomography (SPECT) can better spatially localize a bronchobiliary fistula as compared to planar cholescintigraphy alone, and is useful for preoperative planning if surgical treatment is required. Here, we present the case of a 23-year-old male who developed a bronchobiliary fistula in the setting of posttraumatic and postsurgical infection, which was diagnosed and localized by cholescintigraphy with SPECT. Positron emission mammography (PEM), a relatively novel breast imaging modality, provides certain advantages over magnetic resonance imaging, including the ability to image biopsy samples. 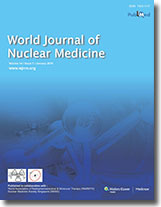 However, the radiation activity associated with PEM has remained a concern in clinical practice. We present a case of an invasive ductal carcinoma that was adequately imaged with a much lower than the standard 185 to 370 MBq activity of 18 F-fluorodeoxyglucose. In addition, we demonstrate ultrasound-guided core-needle biopsy sample imaging with PEM to assess adequacy of sampling, a strategy that has previously only been documented with vacuum-assisted biopsy samples. We present a case of unusually intense Fluorodeoxyglucose uptake in the intercostal muscles during a Fluorodeoxyglucose positron emission tomography (FDG-PET). We hypothesized that severe left ventricular failure causing the patient to be short of breath during the study in association with insulin injection as part of study protocol led to the intense uptake of FDG in the respiratory muscles causing such an unusual appearance.